Beware, the armies within are often many times stronger than they first appear. A commentary, not an opinion. A row of pawns refracted through a glass king. Lit by halogen desk lamps. This really is mindblowingly good isn't it? This shot is the epitome of flawlessness, excellence and perfection. I really like the reflection of the board/pieces. Well done! Nice shot. I like the pawns standing discreetly in the distance. Reflections of the chess board in the King is a good touch. You created a great photograph while staying completely true to the challenge. Perfectly symmetrical. Nice job. Very nice... super name! Love the reflection and subtle (almost ghost-like) background images. Great job with lighting as well. Wow that's so great.... 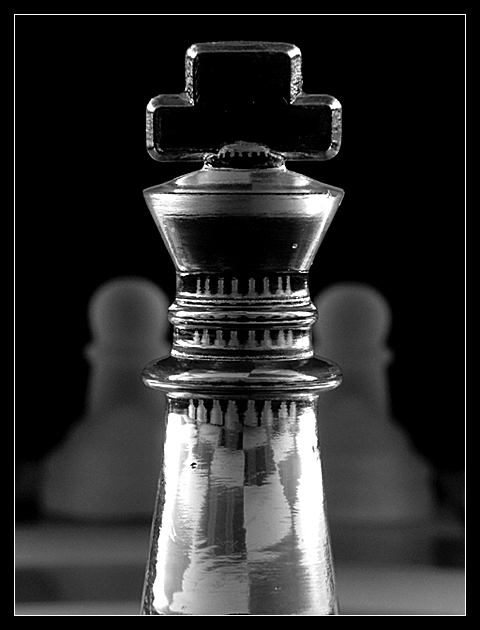 I love the reflection of the chess board on the King. Excellent picture. 9. I like the lighting in this photo. I like the Checkered reflection, with the other peices reflected too. Nice effect. Proudly hosted by Sargasso Networks. Current Server Time: 04/26/2019 09:38:42 AM EDT.